A couple months ago we got a leak about a new Assassin’s Creed game titled ‘Victory’. Much like how Rogue was originally known as ‘Comet’, we figured this too would just be a codename for something else. Well Ubisoft has finally unveiled official details about this new game and what it aims to accomplish. Although despite an initially wary outlook, Assassin’s Creed: Syndicate looks like it might just be that breath of fresh air to reinvent the series – much like Black Flag was in 2013. So let’s take a closer look at the entire Ubisoft event today to see what we can learn. Rather than just jump right into the new game unveil, Ubisoft kicked off their Live Stream Unveil today with a bit of a look back. 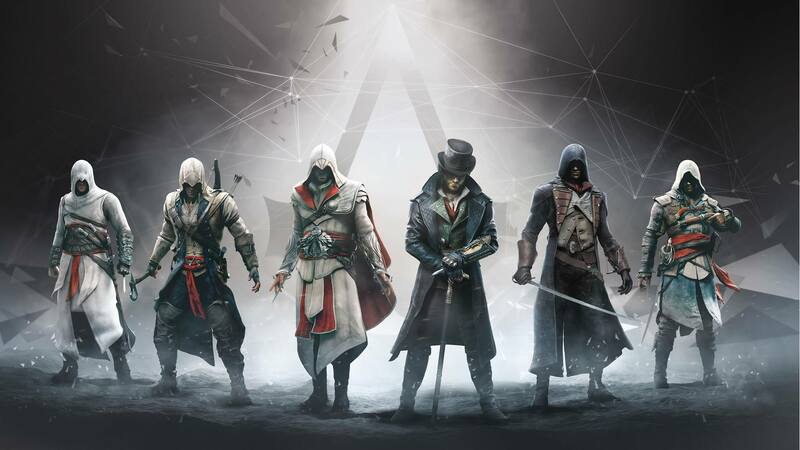 Even the opening graphic paid homage to each of the main game Assassin Protagonists (Altair, Ezio, Connor, Edward & Arno). Although Ubisoft’s most jarring move was to straight up admit the flaws and shortcomings of last year’s Assassin’s Creed: Unity. Despite it being an impressive game in scope and ambition, it was perhaps too ambitious as its flaws and game breaking/horrific glitches soon became more famous than the game itself. So it was in this atmosphere of honesty and acknowledgement that Ubisoft owned up to their past – good and bad –, but also decided to get back down to what made us fall in love with the Assassins Creed series in the first place. They’ve learned a lot from past hits, but even more from past misses. Remember that he stunning Black Flag came out after ACIII – another ambitious but glitched game. With this all in mind, Ubisoft decided that it was time for rebirth. It was time for something that wasn’t just ‘new’, but a genuine evolution of everything we loved from past game. Enter Assassins Creed: Victory Syndicate. When the Ubisoft Team took the time to explain how Assassins Creed III’s brief experiment with Naval Combat set them off on a glorious adventure that would eventually become Assassin’s Creed: Black Flag, it seemed like this game would as well have Naval Combat. After all, AC: Rogue had Naval Combat, and the British Empire did have one of the greatest navy’s of all time, so it would make sense. Well that wasn’t confirmed; but what we got instead was seeing three previous game mechanics reintroduced like never before. Just as Naval Combat was first born in ACIII – but not fulfilled until Black Flag – AC: Syndicate seems to expand on three major introductions of the ACII series – Vehicles, Lifts and Ziplines. With the introduction of the steam engine and basic carriages becoming more affordable, it makes sense that vehicles would serve as a major part of this game world. We’ve navigated the open seas, so why not the roads as well? Well wheras stealing carriages, battling on top of moving vehicles and trying to run opponents off the road might seem new to the AC series, it actually started – to an extent – all the way back in Assassins Creed II. As we see Jacob pursue his target during the test footage, we are immediately reminded of how Ezio tried to rescue Leonardo and had to evade other carriages that tried to run him off the road. Though again – much like Black Flag did to ACIII’s naval combat – Syndicate adds multiple new layers to this old mechanic. Now you can quickly transition between vehicles, use them for cover and even run over your targets with them. By going back to the beginning, the Ubisoft team has once again found a way to turn a novelty into a mainstay. Though Assassins Creed II wasn’t the only innovation of the Ezio Trilogy that gets an evolution for this game. The grapple hook attachment on the Assassins Gauntlet allows for faster ascents, which is not unlike the Lifts that were introduced in AC Brotherhood. These lifts allowed for a quick escape to the rooftops, and the new grapple hook follows suit with offering the playing the same fast ascents. Though these have been a staple in the game ever since AC: Brotherhood. Where Syndicate improves is by allowing gamers to fast ascend wherever they choose as well as a host of other options, such as swinging and even zip-lining. 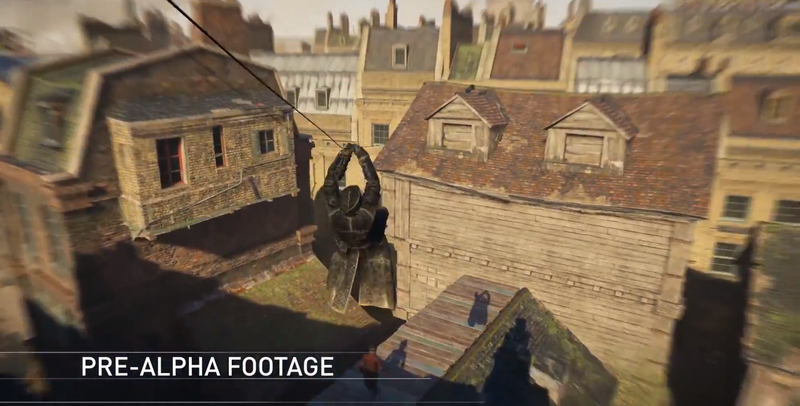 Zip-lines were originally introduced in AC: Revelations along with the innovative Hook Blade. Though whereas the Hook Blade became quickly outdated and not as streamline as other blade additions, the zip-line feature return from time to time in later entries to the series. Whether or not the new Assassin Gauntlet has a Hook Blade attached to it remains to be seen, but regardless you will still be able to zip-line and drop onto unsuspecting enemies – much like the fast ascent grapple hooks – wherever you please. All in all, these enhancements do a lot more than just revive and strengthen old game mechanics. In reality, these all help the Assassins Creed franchise transition slowly into the modern age. Fans have been dying for a modern day Assassins Creed game for year; but few actually stop to think what that entails. With the fast ascent and driving mechanics added, the series is bringing itself into the modern day, and with each installment, the team learns more and more about how this ancient brotherhood could function in the present day. That’s right, “play as Jacob OR Evie”. Despite Assassins Creed: Unity introducing a very prominent female co-lead, there was never a chance to play as her. 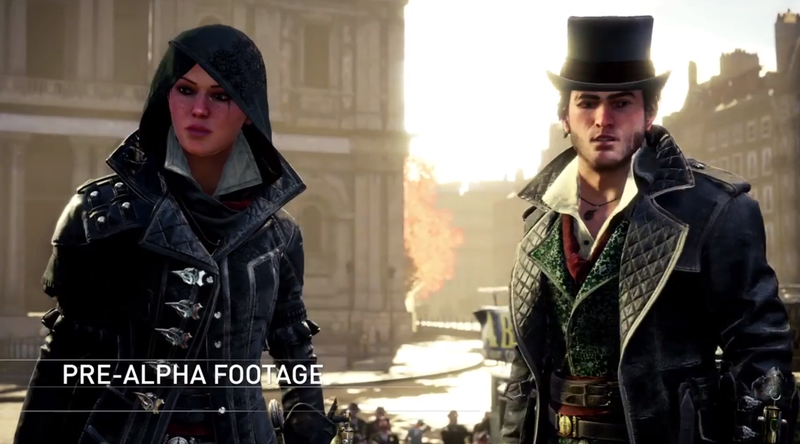 Well AC: Syndicate changes that all around as you will now have the ability to play as the twins Jacob and Evie. Certain story missions will require you to play as one over the other – which makes sense – but for the most part, you will be allowed to choose whom you play as: the charismatic brawler Jacob or the brilliant and stealthy Evie. These two characters are basically two sides of the same coin and can be customized to suit your own game play style. Each will come with their own ‘skill trees’ so in the end you can have an assassin for the bigger fights and another for the bigger heists. Similarly to past great Assassins Creed games, you will see the game from the twins perspective and be introduced to London just as they themselves are seeing it for the first time. Also similarly to past games, you will have to liberate different Templar holdings in order for you to consolidate all the gangs under your Syndicate. In case you still haven’t figured out what a ‘syndicate’ is, it’s an alliance of sorts with a common goal. So in this game, you will be banding together a bunch of slum residents and criminals in order to take back their city. So in short, think of a Syndicate as the new name for “Brotherhood”. The times of rule by crown and cross is over. Now money paves the way and with it comes all the pros and cons of the Industrial Revolution. As you explore Industrial Revolution England, you’ll notice various different boroughs each with their own distinctive style and feel. The reveal told us that there would be Seven Boroughs, London being one of them. Two other such boroughs will be the wealthy Westminster, which will be crawling with police presence, and the dangerous crime-filled Whitechapel where police fear to tread. Considering this takes place around 1868 you can be sure many famous and infamous men of the time will make appearances at least in deed, such as Charles Darwin, Charles Dickens and even Jack The Ripper – we can assume since Whitechapel is an available borough. Though the streets pose more than just the dangers of crime. With speeding street carts, you’ll have to keep an eye out. Though you can also benefit from these hazards as you can now use your environment to your advantage. Why fight a group of thugs when you can send scaffolding and crates falling upon them with the throw of a knife? You’ll have to use these environmental advantages sometimes as Industrial Revolution London is a very different place. You just can’t walk around with a sword at you side anymore, unless you want to get arrested. Instead you’ll have to rely on hidden weapons and brutal short range weapons, like the Kukri. Though if none of this suit you, remember that Jacob isn’t all gentlemen as his walking cane houses a sword as well. Of course it’s not an Assassin’s Creed title – or any game title nowadays – without a ton of special editions, pre-orders and DLC, and Syndicate is no exception. As per usual, each zone will have its own type of ‘Collector Edition’ sets – which I’ll probably detail in full in a later article -, but for now here are the main Game Editions you should know about. 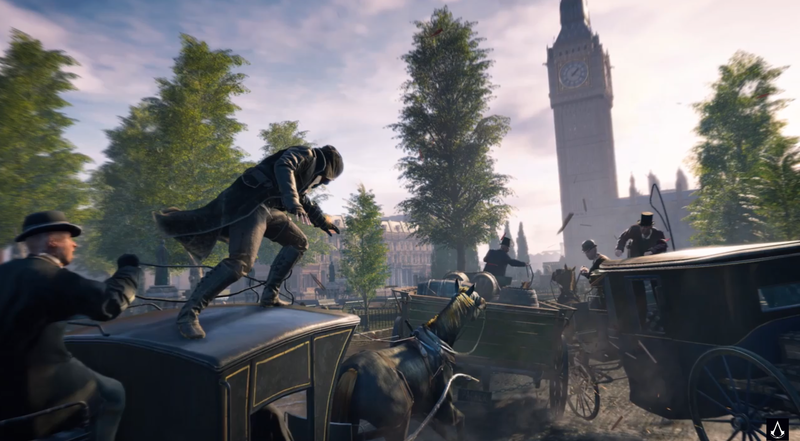 Assassin’s Creed: Syndicate was just announced, so I’m sure we’ll learn some more about it at E3, San Diego Comic Con and other upcoming gaming events. So stay tuned here for more updates and for EVERYTHING you need to know about this Pivotal New Installment, check out my article on that here! *A very special thanks to Ubisoft for holding this live stream event as well as major thanks to Access The Animus for the additional info they provided on different Editions and game elements. Assassin’s Creed: Victory Leaked – New Heights Or Same Falls In 2015?